This AV system costs $17.4 million and is made of gold | What Hi-Fi? The world's most expensive collection of hi-fi and home cinema products? 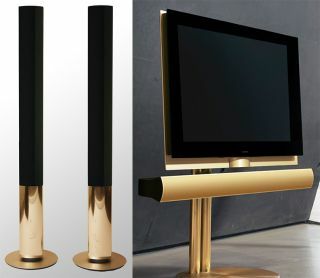 Start-up company BnO Gold has taken six Bang & Olufsen products and replaced the aluminium with "solid 24 carat gold"
The company says it wants to “combine the best sound, the timeless Danish design and the scarcest precious metal, to create a product close to perfection". And you'd want it to be for the price. The products that have been given the gold treatment are the BeoSound 9000, BeoLab 8000, BeoLab 6000, BeoLab 1 and a 103in BeoVision TV. The total cost for all six is an eye-watering $17.4 million. Products are made to order, naturally, and come with a 100-year guarantee. It doesn't look like B&O are involved so we'd triple-check that guarantee. They're expected to weigh around nine times the weight of the originals, with the total weight of gold across the six BnO Gold products adding up to 192kg. The entire collection is being exhibited now until the 14th December at the Masters of LXRY event in Amsterdam ("Europe's leading luxury event"). After the show, the collection can be seen by appointment only. And bring your cheque book. BnO Gold, which was founded by a 22-year-old, says it plans to “conquer the world” with the collection in 2016, and sees the United Arab Emirates and Russia as prime sales targets. It's certainly a decent publicity stunt, though we're not sure the quality of the website will help convince the super-rich to part with their cash.